The best range of luxury Bonzini football tables and foosball for the home and commercial use. Lowest prices & all with free delivery! Guide to buying a football table: 1. Types of Football Table 2. Sizes 3. Key Features. With 100s of tables on the market we take you through the key things to look for when selecting the right one for you. Before Bonzini designed football tables, the company traded in precision engineering and furniture manufacturing from the late 1920s. It wasn’t until the 1950s that Bonzini began to manufacture leisure goods, including the table football table designs they are known so well for now. One of Bonzini’s best known design, the B60, first came out in 1959. It was an instant hit in bars throughout France and is still one of their most popular commercial models today. In the present day, Bonzini tables are instantly recognisable and the company represents the highest standards in build quality, style, durability and playability. Bonzini’s B60 and home version, the B90 are the manufacturers most recognised models, and the designs that spring to most people’s minds when talking about foosball. These tables can be found in homes, bars and leisure facilities all over Europe and the world and are know for their durability. With a sturdy cabinet made from beechwood, chrome plated steel rods and aluminium components, they are long lasting and will endure heavy use. Bonzini's renowned ball control stems from the heavy aluminium player, cork ball combo that gives ultimate control. Pin shots, rebounds and trick shots will be at the heart of your repertoire with a Bonzini. The Bonzini tables are also customisable allowing us to paint your favourite teams strip colours on the players, something that is truely unique to Bonzini. The telescopic rods are a popular safety feature with the Bonzini tables, as they keep players safe from the opponents rods poking out the other side when moving around the field, especially with young players who are more at risk of being hurt. Bonzini tables are among our most popular foosball tables here at Home Leisure Direct as they are so well known throughout Europe and beyond, often seen in pubs, bowling alleys, bars, cafes, schools, colleges, universities, youth clubs, campsites, and even offices and work break-out areas. Lots of our customers have bought these fantastic tables because they’ve had such great fun on them on holiday in the continent, in bars and holiday parks, that they want to buy one for their own home. 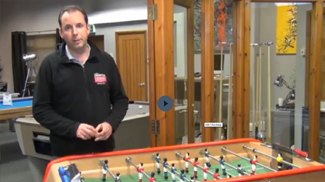 We are proud to offer the whole range of Bonzini foosball tables for sale UK wide and beyond. Our knowledgable sales team have years of experience working with this manufacturer and are happy to answer any questions you may have. We usually have a couple of fussball tables on display here in our Bristol showrooms, they are regularly rotated, but we like to keep a Bonzini on display. Currently we have the Bonzini Classic B60 model on display in our luxury showroom, but if you are thinking of visiting to see these great tables in the flesh, please ring our friendly customer service team on 0800 622 6464 or 01454 413636 for advice on exact models currently on display. So come and try out one of these fantastic fussball tables and the the quality of make and the durability of them for yourself.